Do you have a very small living space? Are you in need of a few decorating ideas? 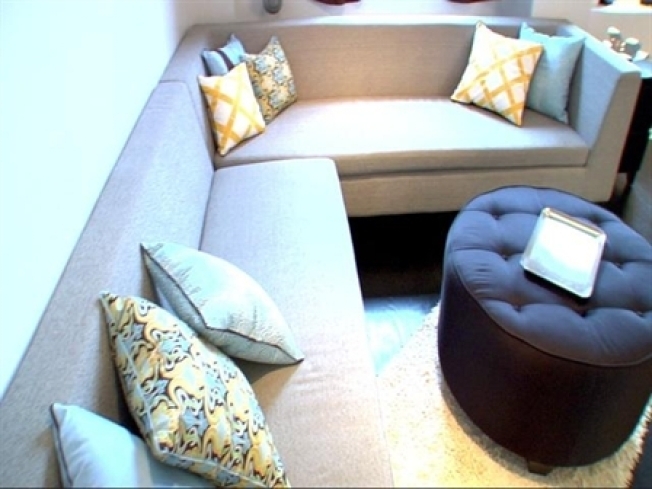 Watch as a young family living in a small apartment seeks help in updating their newly-renovated living room with sleek, modern furniture and accessories that also manage to be child-friendly for their two kids. To create a similar look in your living room, heed these five tips from LXTV and look for shopping information about specific items. Add a more "finished" look to a room with accessories. Personal touches like displaying family pictures and artwork will make the room feel like it's your own. Hang mirrors adjacent to windows. This opens up a room and makes it appear double in size. Use curtains, pillows, and area rugs to add color to a room. Changing these elements is an easy way to transform an entire room without breaking the bank. Placing food such as lemons and apples into a bowl or platter is also a great and inexpensive way to add a pop of color. Design tips from LXTV help a family update their newly-renovated living room with sleek, modern -- yet child-friendly -- furniture and accessories. Find furniture that has storage potential. Use a coffee table with a shelf or cabinet underneath or an ottoman that can double as storage space. Chests can be a stylish furniture piece that is able to store lots of belongings. Stay organized by using shelves, cabinets, and built-ins to hold your toys, books, DVDs and magazines. Put washable covers over pillows so that you'll never have to fret about spills again. Find washable, sturdy curtains that won't easily be ripped when pulled. Look for furniture with rounded edges, and think about using a soft ottoman as a coffee table. This way kids can play to their hearts content without you worrying about them falling and bumping their heads on a hard surface.